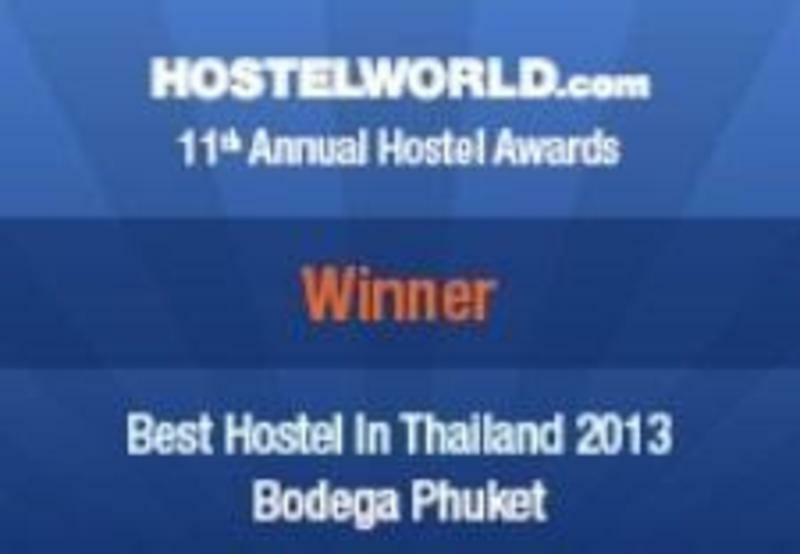 Phuket's favourite award winning backpacker lodge - as rated by you, the Hostelworld traveller!! Bodega is a relaxed and vibey hostel, music cafe and gallery in the heart of bustling Patong - the heart of the action on Phuket. It's only a 5 -10 minute walk (honestly! - depending on the distractions...) to the beach and the nightlife madness of Bangla Road, and yet we are located in a peaceful street, ensuring a good nights rest. We offer comfortable en suite double rooms and dorm beds at reasonable rates and we pride ourselves on our top quality service and relaxed vibe. All private rooms are equipped with King size beds, AC, Fan, safe, cable TV, free Wi-Fi access, and en suite bathrooms. Our 8 bed dorm offers full size single beds with duvets, A/C, security lockers, 2 bathrooms, individual reading lights/power points, free Wi Fi access and a balcony. All linen and towels are supplied. For guests traveling without a laptop we have a guest computer complete with skype phones. We also have a games room and chill lounge, to relax in on those (rare) rainy days. Bodega's cafe/gallery showcases local aspiring artists and musicians, and serves coffees, our famous fresh fruit smoothies, Thai and international food - all at reasonable prices. Regular parties are organized to bring together local musicians and D.J's. Phuket has so much local talent! Our friendly team are on hand to advise you where to go and what to do, and all dive trips, island excursions and vehicle hire can be arranged at reception (We will ALWAYS get the best rates out there for our guests!). One way: Bodega - Phi Phi inc. hotel transfer and ferry - 350 Baht. We (bravely) promise to always offer a warm welcome and that famous Thai smile. Bookings cancelled without 48 hours notice will be charged the greater of one nights stay or 50% of total stay. Bookings cancelled without 24 hours notice will be charged 100% of total stay. Hire a taxi: (should be no more than 800 Baht for the journey) ask the taxi to call us for directions or ask for the Jungceylon shopping centre. A Taxi should cost no more than 500 Baht . Ask for Jungceylon or ask the taxi driver to call. A bus will only cost 50 baht but can take up to an hour. Again ask for the Jungceylon shopping centre and follow the walking instructions. Follow Rat U Thit (Patong's main street) 200m past the Jungceylon shopping centre. Take the first left at the 'Waterworld' dive shop and find us 20 meters on the left. ????????????????????????????? ?????????????????????????????????????? ???????????????????? 200?? ???????????? ????????????????????? ???????????????????????????????????????????????? ??????????????????????????????????????????? ??????????????????????????????????????? ?Water Wolrd ???????????????? ???????????????????????????? ?????????? ?